Naughts & Cross stitches: August WIPocalypse no.2! Well I'm only a couple of days late for this WIPocalypse but considering my week I'm not surprised! I have been stitching quite a bit in the last 3 weeks more than I thought once I started taking pictures of everything. First things first I have a couple of finishes! I finished Sampler Aux Fleurs which I showed you in another post but here is another picture because! I've also finished a Christmas small. I am getting a good start on these for Christmas! He is from one of those Christmas magazines last year part of the free gift section but I didn't like the threads so I replaced all the colours with ones in my stash but I love the way the turned out. Better colours. Started another ornament too Ho!Ho!Ho! by Full Circle designs. It's from the Just Cross Stitch that came out this year with 12 ornaments in it. I love this design. Should be finished soon when I actually put the time on it! I really need to get cracking with all my Christmas stuff for this year. It is getting closer and closer! 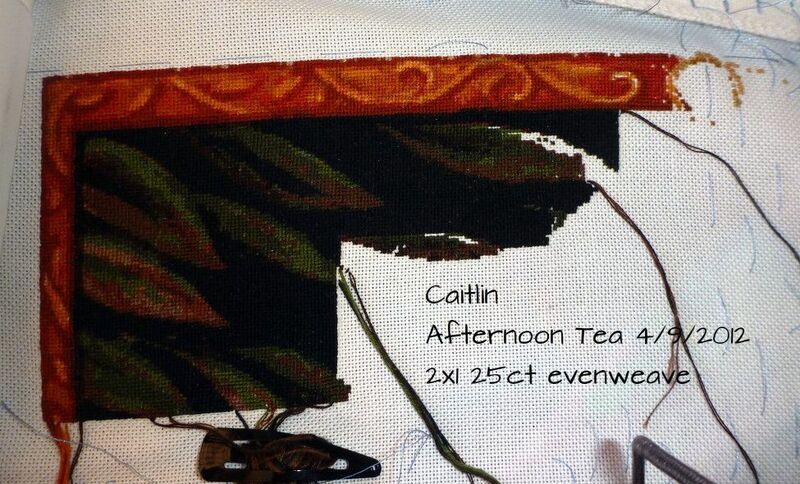 I have been working on Afternoon Tea :D and making good progress... I use a mix of stitching techniques on this one. I won't have much work on this one for a little while as all the Christmas and birthday knitting will have to take priority! Done more than I thought considering how little time I actually spent on this one! I am thinking of starting a rule with this one to put at least one stitch into it each day ... maybe that might get it done quicker! Oh and because I finished Sampler Aux Fleurs I started a new bigger project! The Winter Fairy by Joan Elliott. 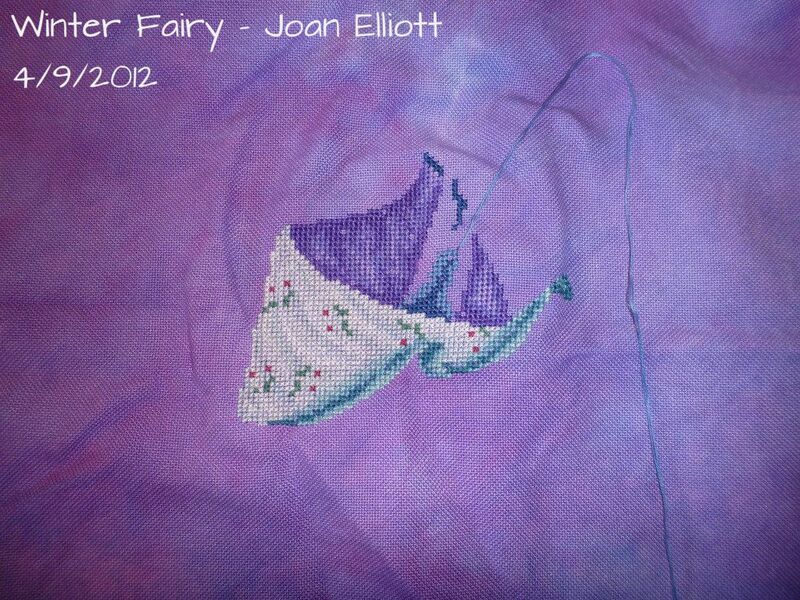 One day I want to stitch the whole set of these fairies but this one is a good start. I love the purples in the fabric and on this design. This will be slow and steady wins the race as the Christmas stuff is more important. Do you notice a trend in what I have been saying? 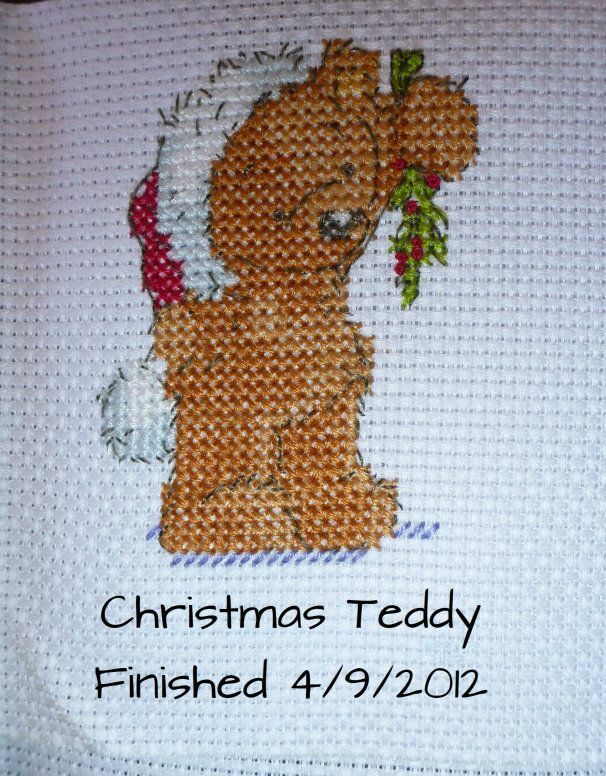 I want at least 1 more if not 2-3 more Christmas smalls finished this month because if I don't I won't get it all done! So that is my goal we shall see if I make it! wow very sweet finishes..i love them all so much.. 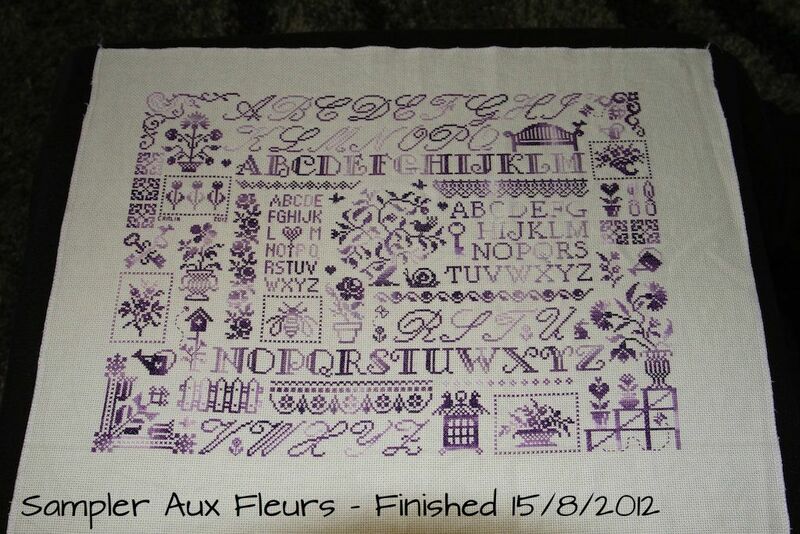 Your sampler aux fleurs is so beautiful. I love this pattern. And your colors are fantastic. And your afternoon tea looked great. I`m looking forward to see more. Great finishes, and very nice WIPs - great going! You've done a great job! Very beautiful work. Great work. 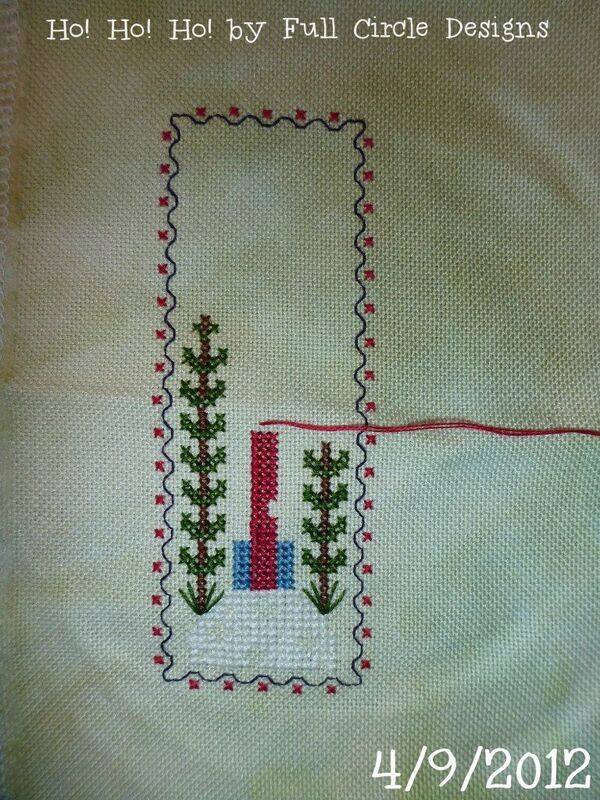 I like your one stitch a day plan. I was thinking 5 a day with some of mine but when they're all different colors one would be just as good. Good luck with the Christmas pieces. I look forward to seeing them! Great finishes and progress on the others Caitlin. I love the purple fabric. Beautiful stitching! I particularly love your Sampler Aux Fleur - what a wonderful piece. 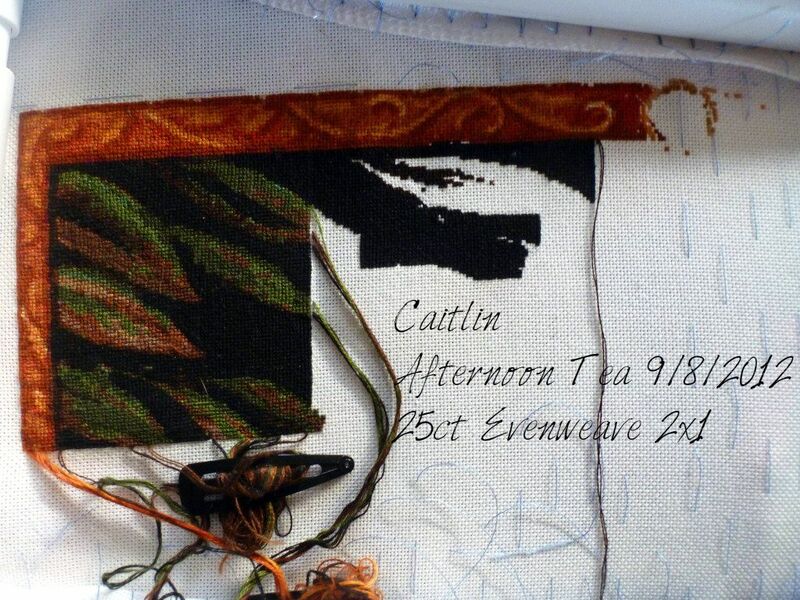 You've got great stitching mojo, Caitlyn! Afternoon Tea is flying along. Your Christmas smalls look wonderful. The Jardin Prive sampler is gorgeous! Congrats on your finishes! Everything you've shared looks so pretty. Congratulations on finishing that big sampler. It looks gorgeous aqnd it must be a great feeling of achievement to look at the finished piece. Great progress on the other projects. Congrats on your two finished. Sampler aux Fleurs is beautiful and the teddy is cute. Your other WIPs are coming right along.